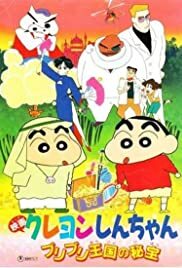 Watch Crayon Shin-chan: Buriburi Ôkoku no hihô full episodes online English Sub. Synopsis: A band of criminals want to get the treasure of the famous Treasure Island, but the key of the treasure chamber is guarded by a little kid. Then, they come to Japan and kidnap Shinosuke Nohara by mistake, who looks exactly like the little kid who has the key.